As the Packer season developed this year, talk of the Super Bowl began to cross our lips. Thinking of Super Bowls past, I recalled my time working at a sandwich shop when I was in high school and college. 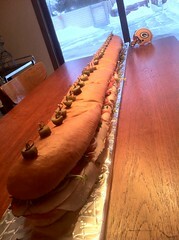 The Super Bowl meant one thing back then: I'd spend the majority of the day preparing 6ft hoagies. While telling the story, I mentioned, "if the Packers make it to the Super Bowl, I'll make a 6ft sub." Where does one find 6ft loaves of bread in Minneapolis? Wuollet Bakery! With bread on hand and meat and cheese scored from Kramarczuk's, we built a colossal hoagie to celebrate the occasion, and we named it Raji's Rocket, after my favorite Packer this season. 3ft of it was Italian - cappicola, mortadella, and salami with provolone and mozzarella. The othr 3ft was a club - smoked ham, turkey, and bacon with Swiss and cheddar cheese. I even managed to sneak some of my favorite DragSmith Farms micro greens on it. There was much rejoicing during and after the game, and commemorative Raji's Rocket souveniers, in the form of leftovers, were send home with rejoicing guests.